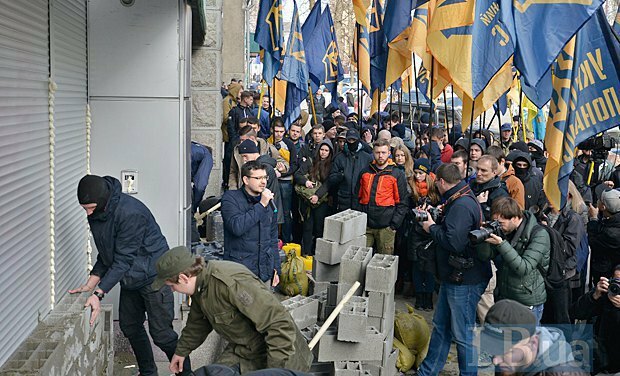 The nationalists are protesting against the bank's operation in Ukraine. 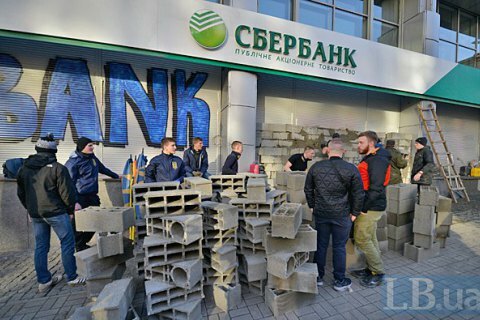 Activists of the National Corps Azov party put up a brick wall at the entrance to head office of Sberbank in Kyiv's Volodymyrska Street on 13 March. The wall is around 1.5 m high. They also put sand sacks with the logo of the Russian rouble near the car gate and put up a tent in which they are planning to spend the night. They allowed an ambulance and cash vans to leave the backyard and bank employees to leave the office. Last week Interior Minister Arsen Avakov demanded that Sberbank be closed down in Ukraine because its head company in Russia started servicing clients with identification documents issued by the Donetsk and Luhansk separatist authorities. The leader of the National Corps is Andriy Biletskyy, who also supervises the National Guard's Azov regiment of the Interior Ministry.